I am regularly asked for ideas for caricature gifts. When it is for a couple or group, my suggestion is normally to depict some aspect that is common to each person, that each will be able to recognise and appreciate the not only the artwork, but also the thought of the gift giver. Some time the gift giver is in the image, as in this example. 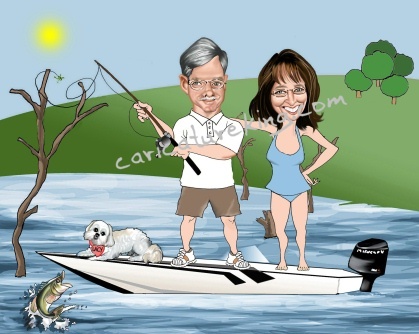 The three of us – husband Rob, Wife Laura and Puppy Lacy in a black and Silver Ranger Bass Boat fishing on a wooded lake. The lake has dead trees and stumps coming out of the water and on one of the trees, there is a snagged light green frog lure dangling from a branch. In the back ground a Bass has jumped out of the water. Laura is wearing a light blue turquoise halter style tankini. Rob is wearing denim shorts and a white three button polo shirt (no Pocket) and lacy has a pink collar with a light purple heart shaped tag that reads LACY. Lacy’s bottom teeth are usually showing over her lip. The whole scene I have described is something my husband and I do almost every day in the summer, so pardon me if I’m being so detailed. I LOVE IT!! It looks great!! Please tell George he is THE BEST!!!!! I wish you could both see the smile on my face!! It has been a pleasure working with you both!